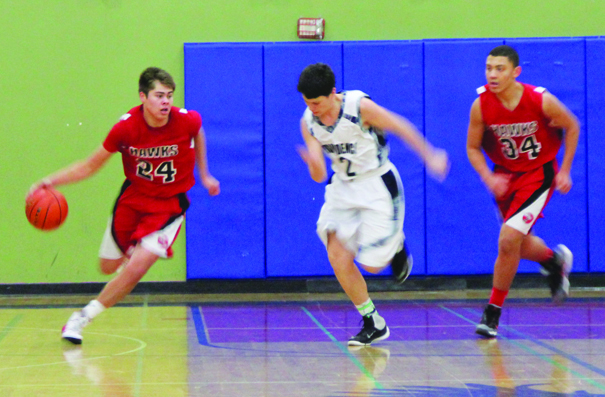 Back on Monday, December 27, the Heritage Hawks were coming off an 18 point loss to the hands of Neah Bay. The loss dropped them to 1-5 on the season and near the bottom of the Northwest 1B league standings, only one win better than winless Grace Academy. The outlook was bleak, as the Hawks had graduated four of their senior starters from last season, and this present team resembled nothing near the squad that went to the Tri-District tournament last February. Fast forward a month and nearly everything has changed. The wins came in waves; first a was a four-game win streak with victories over Lummi, Rainer Christian, Lopez Island, and Lummi a second time. The momentum was stopped cold on Monday, January 11, with a lopsided home defeat to the then undefeated Orcas Christian. In that loss, the Hawks scored a meager 33 points, which the lowest a Tulalip team has scored in over five years. However, the Hawks didn’t allow the sting of that loss to linger as they quickly got back to their winning ways. First up was an away game vs. Grace Academy on Wednesday, January 13. The Hawks made quick work of Grace, who remains winless on the season, by running away with the game early. The final score was 58-22. Next up was another away game, as the Hawks traveled to Redmond to take on Providence Classical Christian. The Hawks took a large lead early, but had a defensive letdown in the 2nd quarter, allowing Providence to cut into their lead. At half time the Hawks led by only 4 points, 26-22. After reengaging defensibly, the Hawks were able to force turnover after turnover and convert easy transition buckets. Josh Iukes scored 14 points, Willy Enick had a double-double with 18 points and 11 rebounds, while Robert Miles had his first triple-double of the season with 21 points, 11 rebounds, and 10 assists. The Hawks won 61-40. The third game of their road trip was against Lopez Island on Tuesday, January 19. After trailing 11-12 going in the 2nd quarter, the Hawks were struggling to find their offensive rhythm. That is until Josh Iukes took the reins and had his best game of the season by far. Josh finished the game scoring a game high and season high 27 points, but most importantly led his team to a 50-37 victory. Hawks play against Providence Classical Christian. After going 3-0 on their road trip, the Hawks came back home on Thursday, January 21, to host Providence Classical Christian. There would be no defensive letdowns this time around vs. Providence, as the Hawks took a 16-6 1st quarter lead that turned into a 35-17 lead at halftime. The Hawks would go onto to win 64-38, stretching their winning streak to four games. Robert Miles led all scorers with 20 points, while Willy Enick and Josh Iukes both chipped in 15 points. For the second time this season the Hawks were riding a four-game winning streak into a big time matchup. This time around it was against Lummi Nation, played at home on Friday, January 22. After winning their first two games vs. Lummi the Hawks were confident they could win again, but were a little on edge as Lummi had just beaten the previously undefeated Orcas Christian only days earlier. The game started out competitive. The Hawks trailed 7-11 after the 1st quarter, and with only two minutes to go to halftime it was a three-point game, 14-17. To this point the Hawks had pretty much matched Lummi in terms of effort and hustle. Both teams defensive was making it difficult to find easy shots. Then Lummi went on a run. They closed the half on a 2-7 run, leaving the Hawks trailing 16-24 at halftime. It would only get worse from there. The Hawks weren’t able to keep up their defense and weren’t able to run their offensive sets in the 3rd quarter. Tulalip got outscored 13-33 in the quarter and trailed 29-55 going into the final eight minutes. Unable to mount any kind of comeback the Hawks lost 54-78, ending their four-game win streak. Fortunately, the Hawks had a game the very next day vs. Lopez Island, so they didn’t have to dwell too long on their loss to Lummi. 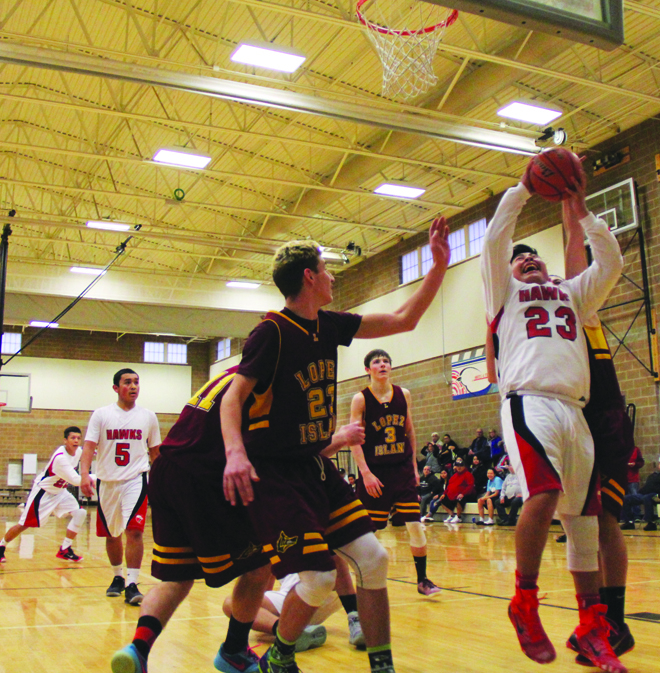 The Hawks hosted the Lobos on Saturday, January 23, and made short work of the visitors in a 46-30 victory. So after a very disappointing 1-5 start to the season, the Hawks have bounced back to go 9-2 over their last eleven games. Currently sitting at 10-7 (9-3 within their league), the Hawks are in 2nd place in the standings with only three regular season games to go before the District playoffs. The Hawks have proven that they are clearly one of the best teams in the league, along with Orcas Christian and Lummi. The question is, are they able to contend against either when they face off at Districts? We’ll find out soon enough, as the District tournament starts on Friday, February 5.